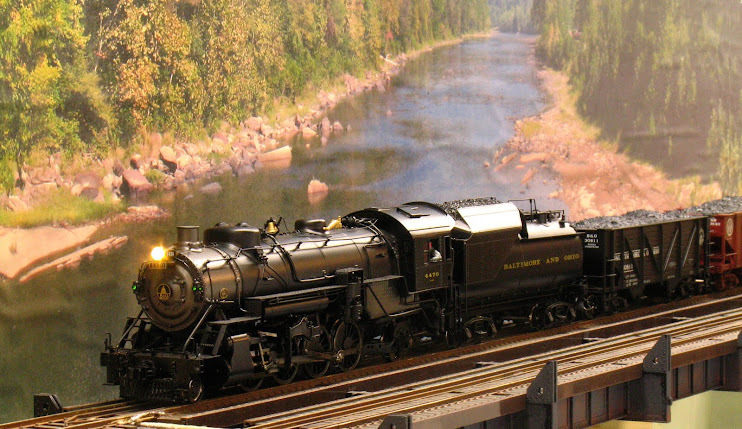 2-Rail O Scale Railroading: LEDs for Layout Lighting? A basement-filling layout can consume a lot of electricity to light properly. I currently use florescent lighting to illuminate my layout, but even florescents draw a bit of current when they are all on. LED lighting is the up and coming technology but, putting cost aside, are they suitable for layout lighting? 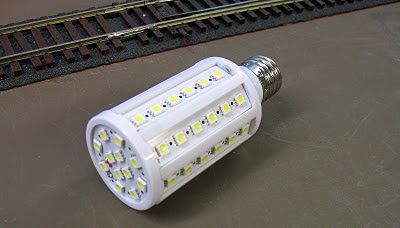 I've been collecting samples of LED bulbs and testing them on my layout and here are some results. I've been testing 1+ watt LEDs and these do generate some heat and get hot; so hot in fact that the bulbs have built-in heat sinks. Because of how they are constructed, LEDs are good for spotlights, but getting the light to spread is difficult. You can see the four 1 watt LEDs. Notice that the light is intense, but limited to an area slightly larger than the car itself. This is not exactly a bulb, but a self-contained spotlight. 110V has to be supplied to the two wires, which is easily done with a electrical cord. Electronics in the base converts the 110V to use by the LED. Again the light is bright, but confined. Here is the car illuminated by a 4 watt LED bulb that looks like a bulb. As you can see by comparing with the photo above, this bulb barely illuminates above ambient. It would only be good for mood lighting. Unfortunately this bulb did not work out any better than the others. I could not get a good picture of the light output because the bulb seems to fool the sensor in my camera and the pictures have an strong overall blue tint. That alone would disqualify this bulb for photography purposes. The visual appearance of the light was much like the bulb immediately above, somewhat above ambient illumination. This bulb was mounted into a fixture that had a reflector, so all of the light was directed towards the layout. The nice, even, soft, well distributed illumination is hard to beat. This has been somewhat of an apples to oranges comparison inasmuch as two of the LED bulbs were spotlights. But as you can see from the last LED bulbs, diffusing the meager light from an LED results in a very feeble light indeed.